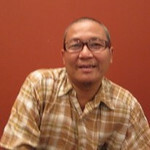 As is common with artists of his generation (born in 1958) Ngwe Aung started his career as an illustrator, specializing in covers of comic books. In the late eighties he started painting with oils, but it was not until this last decade that he discovered the landscapes of Myanmar and the joy of depicting those wide scenes with exuberant color. His current series depicts the uplands of Shan State, with their patchwork of fields, terraced hills and small farming settlements. Through his use of a symphony of color, he transforms these scenes into something more vivid and theatrical than nature itself. Molten lava flowing down mountainsides; terraces of shimmering gold, violet skies with tumbling clouds….We viewers are left breathless by the majesty and drama of these remote regions. 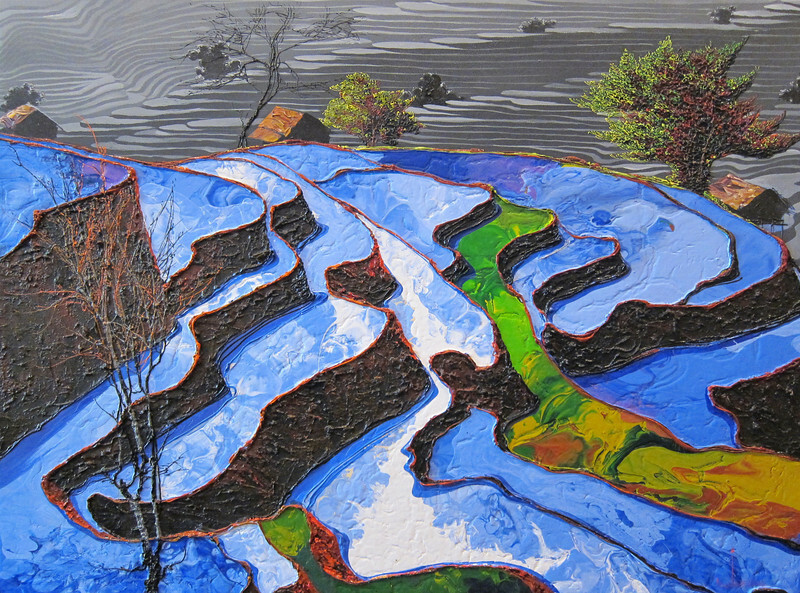 Through his technique of using raised ridges of paint to outline features of importance in the work, he achieves a distinctive three dimensional effect, imparting a texture that invites one to touch as well as view. These stunning works seem to leap off the wall, barely containable in a rectangle of canvas.